With a handful of practices and one scrimmage down at Minnesota Wild development camp, a few players have taken their first opportunity skating with the new coaching staff to stand out from the rest of the prospect pool. Development camp is a unique situation. It’s an opportunity to make a good impression, but it’s not training camp. Young players are gathered at Xcel Energy Center to work on skills and focus on what it takes to become an NHL regular. While it’s just a few practices and two scrimmages, giving just a limited window on what players are capable of, there are still some takeaways available as the Wild look toward a season where they’re likely to get some contributions from rookies in a way they did not last year. Here’s a look at nine players who made a mark early in camp. The team’s 2014 1st round draft pick is making the transition to pro hockey this fall following two years at Boston College. He looks ready. While some of last season’s AHLers like Zack Mitchell and Brady Brassart stood out for their hustle in drills and clear leadership, Tuch was the most talented player on the ice. His puck skills are excellent and his strength was clearly a step above the fray. He was able to protect the puck and find open space consistently in the scrimmage, despite being placed against the other team’s top line every shift. On a line with Sam Anas and Joel Eriksson Ek — largely playing against Mitchell, Jordan Greenway and 2016 1st round draft pick Luke Kunin — he was able to control play at both ends of the ice. 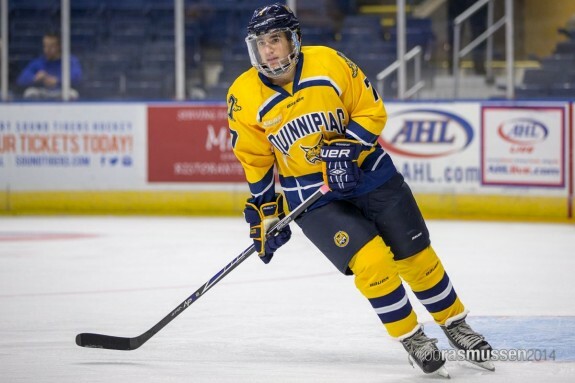 The 5-foot-8 free agent signee out of Quinnipiac has been an under-appreciated signing. He’s a very talented player with very strong offensive skills. His size has aided him being overlooked, but he was also something of a late bloomer. Nonetheless, he has stood out at camp. He scored a beautiful goal in the scrimmage and showed that his puck skills and shot are a cut above the rest of the prospects. He isn’t particularly strong in the corners or board battles, but that was probably accentuated at camp because he’s still recovering from a shoulder injury. He told The Hockey Writers that it’s “almost 100 percent.” The way he battled through that injury during the Frozen Four should show that he’s not short on toughness. Seeler has taken some big steps forward. He’s a great skater and showed good hockey sense in the scrimmage, looking like he was ready for the transition to the pro ranks with Iowa. He was dominant partnered with Louie Belpedio in 2-on-2 drills on the second day of camp and was one of the best defensemen on the ice during the scrimmage. He may climb the depth chart more than expected this year, providing good competition for some of the more seasoned guys in Iowa like Christian Folin, Gustav Olofsson and Mike Reilly. One of Seeler’s biggest assets is his strength. He laid some big hits, even in a situation where most players are pulling up a bit since these are teammates and it’s the summer. The team’s 2015 1st round draft pick looked excellent as well. He’s certainly angling to make the team this year, but may spend another year playing professional hockey in Sweden before making the jump. His offensive skill is unquestionable. He has good vision, is a great puck mover and was taking shots to make plays during the scrimmage. His strength and size are a big reason that there are many who think he’ll take another year of development abroad, and that may be the case but he looked like he was trying to alleviate those concerns by playing a physical game along the boards. The team’s youngest 1st round pick looked eager in what was likely a bit of intimidating position. It was his first development camp and the first time he’s meeting the majority of his future teammates. He was noticeable in drills and at the scrimmage, proving his reputation as a hard worker and a player with strong hockey sense. What stood out most his play away from the puck. He was always in a good position to make a play and exhibited the ability to see where the play was headed before it got there. While the WCHA standout signed an amateur tryout with Iowa Wild following the conclusion of his senior season at Michigan Tech, he doesn’t have a contract for this coming season and is the only invitee to make this list. His vision was remarkable. He read the game as well as any player on the ice. He scored a beautiful goal during the scrimmage that was the result of great defensive positioning, a heads-up pass and impressive speed. He has the tools to be an asset to the Iowa Wild. If any forward invitee comes out of camp with a contract, it should be Petan. Though it’s tough to see him making the NHL squad with the team historically hesitant to bring up too many small players. There are a handful of undersized guys ahead of him on the depth chart if he gets signed, including Anas, Jordan Schroeder and Christoph Bertschy. Greenway is an interesting player. On paper, most wouldn’t expect a 6-foot-6, 226-pound forward to be as offensively gifted as Greenway is. 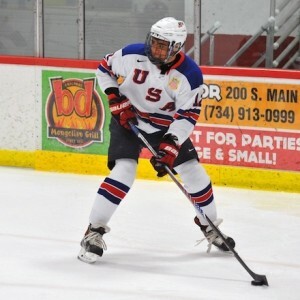 His ability to use his size to protect the puck, coupled with a strong set of puck skills could make him a big asset when he eventually makes the leap to the pro ranks. That’s probably at least another year away, though. Soucy was ok during the scrimmage but stood out during practice as on of the best skaters on the ice. He has a lot of the tools he needs to succeed at the next level. He hasn’t signed a pro contract, so he’s expected to return to the University of Minnesota-Duluth for his senior season, but that might be a good thing. The defensive corps in Minnesota is pretty well stocked. Staying in Duluth means that he’s getting good ice time and more varied usage. Additioanlly, he needs some work on his puck work. His puck skills aren’t poor, but he wasn’t standing out with his ability to break the puck out or make things happen in the offensive zone, and that matters since he’s almost 22, making him one of the older players on the ice during camp. The Hungarian goaltender has taken an unexpected road to wind up where he’s at. Players coming through the WSHL junior program in the U.S. or the Hungarian pro league aren’t frequently finding their way onto NHL rosters. In fact, if he finds his way into an NHL game he would be the first Hungarian player to do so. So the Wild signing him as a free agent after an impressive performance at the 2016 World Championship was a surprise. Yet, he may have been the best goaltender on the ice at camp. The 6-foot-5, 22-year-old netminder is very athletic and showed more than adequate lateral speed for a goaltender his size. He looked poised to grab some games from Alex Stalock in the AHL, depending on how things shake out between those two and Stephen Michalek. Despite taking the path less trod, he looks like a player who could surprise in the team’s system. The final scrimmage of Minnesota Wild Development Camp will be held Sunday, July 16 at 5pm. It’s free and open to the public. Not appearing at camp were Russian prospect Kirill Kaprizov, Tuch’s BC teammate Adam Gilmour, as well as Christoph Bertschy, Gustav Olofsson and Dylan Labbe who all played for Iowa last season. Grayson Downing and 2016 draft pick Dmitry Sokolov did not participate due to injury.